IN THE SUBURBS OF VICTORIA FALLS Gertie's Lodge is a quite suburban lodge that offers tourists a welcome retreat after a full day of sightseeing in the Victoria Falls area. 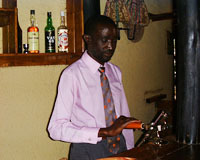 Experience the personal and friendly attention of our hosts and soak up our true African hospitality. 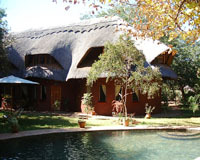 Situated 2km away from Victoria Falls Town Centre Gertie's Lodge comprises four lodges, brick under-thatch, each with two bedrooms, seperate shower/toilet and living room area. The master bedroom upstairs also has a settee which converts to a double bed. 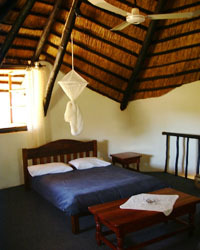 All lodges can sleep up to six people, ideal also for families. 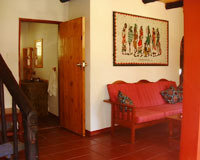 Each lodge is equipped with coffee/tea making facilities. 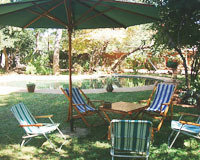 Our crystal clear swimming pool, situated in a beautyful garden, gives perfect respite from Victoria Falls scotching heat. We do all the catering for you and our restaurant serves very good meals. We also have a lovely barbequeu area in the garden. You can quench your thirst in our bar while you watch the big display of Malawi fish in a huge fishtank, or relax in our TV lounge with DSTV or German TV. We furthermore also have laundry facilities and in our reception we offer telphone and e-mail services. We will also assist you with all your activities, i.e. whitewater rafting, canoeing trips, scenic flights, elephant riding, bungi jumping etc. 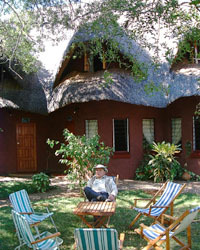 We offer day excursions to Zambia, Chobe NP in Botswana and Hwange NP. We also conduct tented safaris in small groups to all countries in eastern and southern Africa, so Gertie's Lodge is the ideal starting point for your exploration of this exciting continent. All prices are on B&B basis and we do specials for groups.